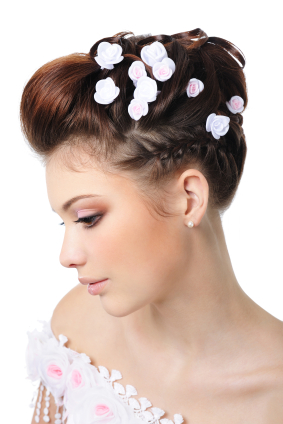 Some of the most romantic looking and formal looks you can create are Updo hairstyles. They carry you through from an everyday look into a more red carpet appropriate evening do. They do take a while to practice and get right, but it’s so worth it! You will look like you’ve made an effort, and look perfect at any special occasion or event you have in your diary. If you want a really special Updo hairstyle, you could go to a local hairdresser, who can practice different looks for your formal event to suit your face shape. Having an Updo hairstyles for prom is almost essential. It will make you look like a princess, and feel like one too! Get inspired by the current catwalks as well as magazines and movies. Take a whole load of ideas to your hairdresser, or get your girlfriends round to practice different Updo hairstyles on each other at home. Add some cute accessories to your look; flowers, diamonds or a tiara will give you that extra sparkle and individuality. Updos at weddings need to be sturdy and long-lasting. Its best to get a professional hair stylist to create a look for you, as they will have better tools and more experienced hands. What you can do at home is experiment with different styles, so you know what to ask your stylist for. Work out what suits you and goes with your beautiful dress. You might want your bridesmaids to have a simple Updo hairstyle as well, so make sure to plan in enough time for them to go to the hair stylists too. There are some Updo styles that you can wear everyday. You might have to practice a lot before you feel comfortable and are sure that it is secure enough to last a whole day. Start by backcombing the roots of your hair. Hold the hair taut at a 90 degree angle, and work the comb towards your roots, do about 4-5cm. Take it in sections until the whole head is covered, this is the key to making a look last longer, as well as giving it body. Then divide the hair into three sections. One square on the very top of your head, and two sections either side. Take one side section and bring it backwards and upwards, brush the top of the section so it is smooth. Twist the end of the section upwards, and then tuck the end of the twist behind the main central fold. Copy this on the other side and pin into place. Take the top square section, and backcomb even more to create a quiff (as above). Bring the quiff back to the join of the side twists and pin under itself. Let this look a little undone and effortless. Spray with hairspray and wear with lots of eye liner.